Minecraft renders Blocks in different ways depending on the type of the block (see diagram below). Unusual blocks in vanilla minecraft (eg doors, pistons, bed, etc) are rendered using the corresponding .renderBlock#### method in RenderBlocks, for example renderBlockBed(). Create a class MyRenderer which implements ISimpleBlockRenderingHandler. 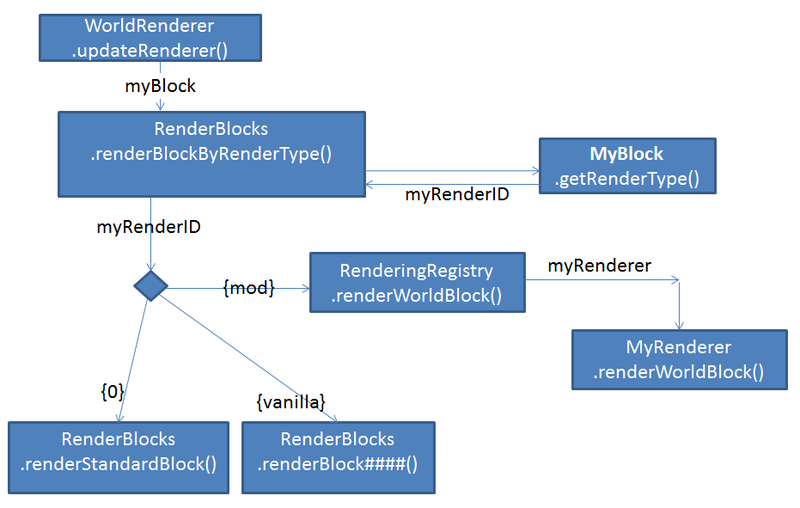 Ensure your myBlock.getRenderType() returns myRenderID. Put your custom rendering code in MyRenderer.renderWorldBlock(). When rendering Blocks, minecraft uses a 'cached renderlist' that is only refreshed when the block changes. So if you try to animate your Block using the Block rendering methods above, you won't see anything until the Block is changed or updated. If you want your Block to be animated, you need to either use an animated texture for your Block, or use a TileEntity with TileEntitySpecialRender. These tutorials are fantastic and exactly what I've been searching for! I do have a question, though, if you're willing to answer. This seems to be how it should work. I I've gotten it fine until I went to bind a texture. Calling the render engine in my render file binds the texture to my block just fine but seems to remove all other textures in the chunk. Have you ever seen this happen behore? Am I going about this the right way? I figured it out. :) When rendering with ISimpleBlockRenderingHandler, playing with the rendering engine at all seems like a bad idea. But simply registering my textures with IconRegister did the trick! Very different from using TileEntitySpecialRenderer for doing rendering.